in the Legislative Assembly of Assiniboia by Hon. 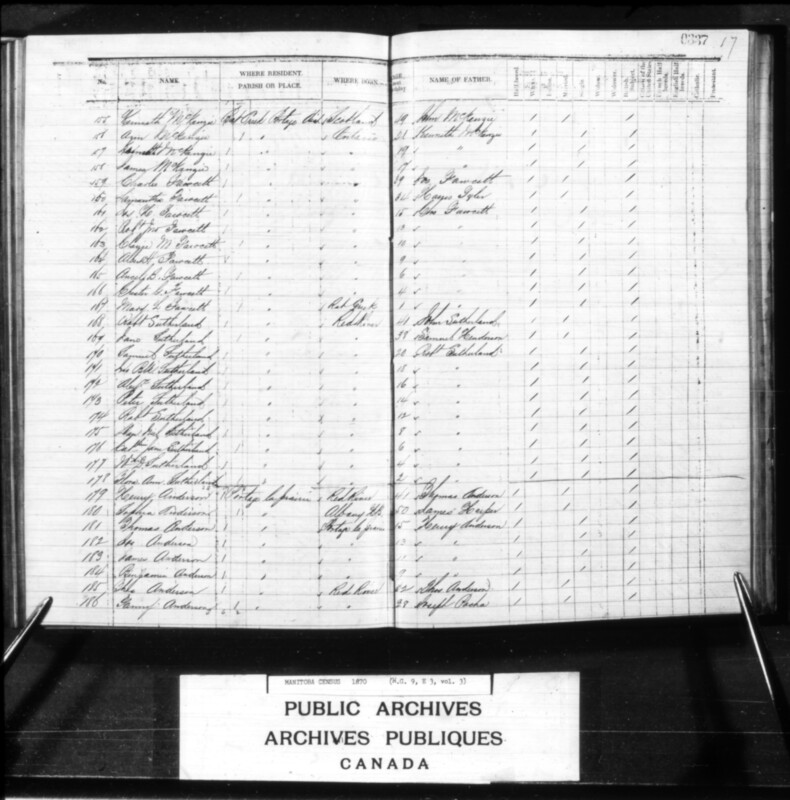 William Garrioch Jr.
Beginning in 1851, twenty-five families followed John Garrioch (school-teacher and brother of William Garrioch Jr.), to relocate from Red River Settlement to the area known as Portage des Prairies — a location on the Assiniboine river where a trade route led north over the edge of Long Plain (an ancient buffalo hunting and sturgeon-drying ground) to Lac des Prairies/ Lake Manitoba. John Arnot Fleming, chromoxylograph, showing a view of the long prairie west of Prairie Portage, 1858. Source: Henry Youle Hind, Narrative of the Canadian Red river exploring expedition of 1857, and of the Assinniboine and Saskatchewan exploring expedition of 1858 (London: Longman Green, Longman and Roberts, 1860), 135. John Arnot Fleming, woodcut, “Prairie Portage,” 1858, showing a First Nations encampment near the church of St. Mary’s la Prairie (the decorated tents suggests Dakota/ Santee Sioux from south of the U.S. border — possibly visiting in connection with the Sweet Corn Treaty). Source: Henry Youle Hind, Narrative of the Canadian Red river exploring expedition of 1857, and of the Assinniboine and Saskatchewan exploring expedition of 1858 (London: Longman Green, Longman and Roberts, 1860), 145. The Portage was home to Saulteaux/ Ojibway First Nations — Chief Pequakekan/ Pee-Qua-Kee-Quah (who had died in the 1860s) had been a son of Chief Mechkadewikonaie/ la Robe Noir/ ‘Black Robe,’ an initial signatory of the 1817 Selkirk Treaty. By 1870, however, there were also Dakota/ Santee Sioux (as many as 400 relatively new arrivals seeking refuge from U.S. government forces, and related to Saulteaux/ Ojibway from the time of the Sweat Corn Treaty of 1858). In addition, the A’aninin/ ‘White Clay People’/ ‘White Mud’ (a.k.a Gros Ventres/ ‘Big Belly’/ Piik-siik-sii-naa/ ‘Snakes’/ Serpente), had traditional ties in the region (and ancestral ties to Saulteaux/ Ojibway Anishnaabemowin-speaking peoples, being of Algic/ Algonquian origin). At the time, Archibald considered First Nations to be sovereign. Until they agreed to enter a treaty with Canada, their lands could not be counted as co-extensive with the Red River Settlement or as available for settlement by outsiders (though newcomer Canadians had staked claims on unceded lands as early as 1868). Treaties 1 and 2 were negotiated with First Nations (excluding Dakota) of the Portage region and outlying locales in 1871, but the terms were disputed to 1876 (and beyond). 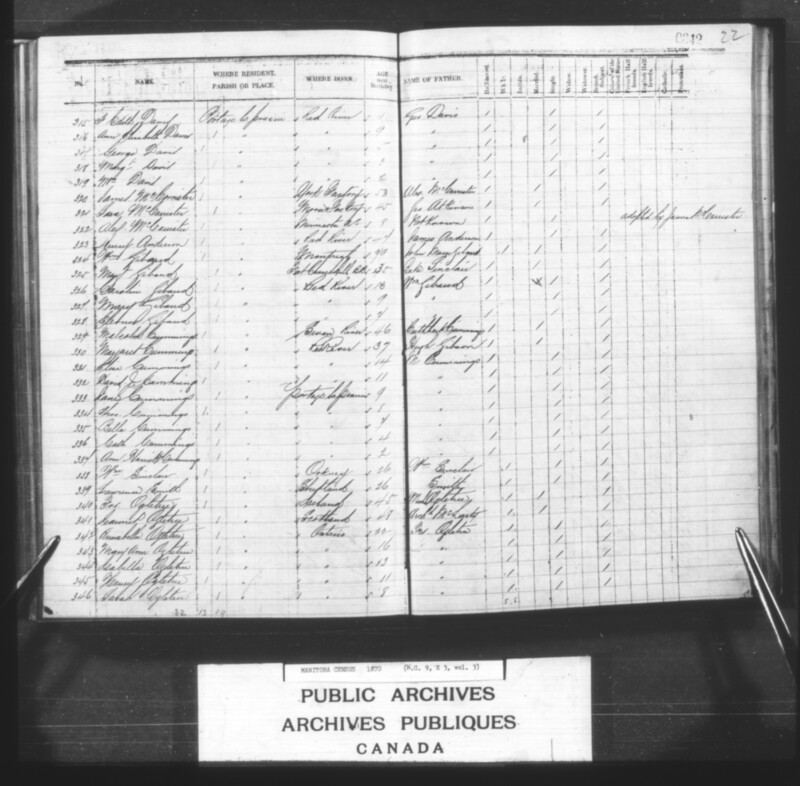 The number of First Nations individuals missed by the Archibald census, but who were considered to figure among ‘the people’ of Assiniboia during the Resistance of 1869-1870, was significant. 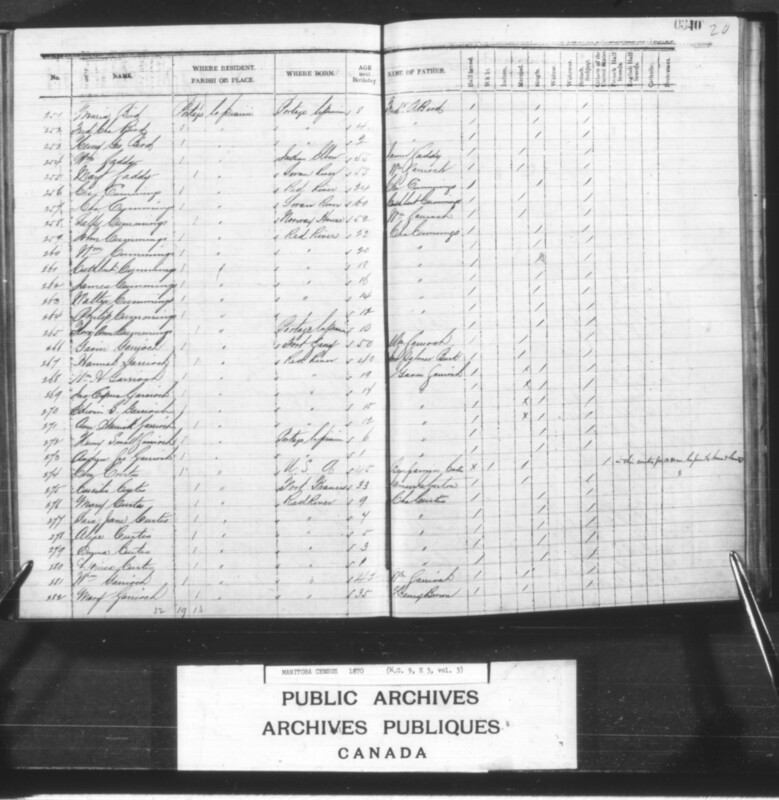 Names compiled in the 1871 Treaty One Paysheet are included below. 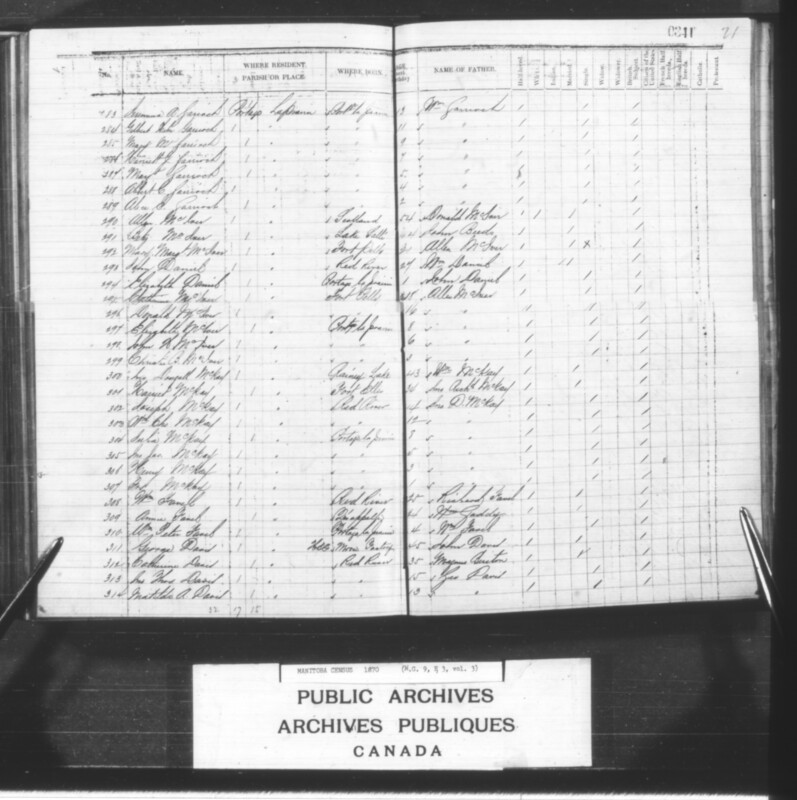 In 1872 the Portage La Prairie Band numbered about 425 people, in 1873 about 478 (excluding people from Whitemud — see St. Margaret’s/ High Bluff. [and ID# from D.N. Sprague and R.P. Frye, The genealogy of the first Metis nation: the development and dispersal of the Red River Settlement, 1820-1900 (Winnipeg: Peguis, 1983). Akakaya/ Akohkaya, married to an unidentified woman. Edward [served in the American Civil War? ]; left for the U.S. “in the early 1870s”; permanently settling at Gaa-waabaabiganikaag/ ‘White Mud’/ White Earth Reservation, Minnesota, by 1880; photographed as a member of a treaty delegation which negotiated terms with the U.S. government after the Battle of Sugar Point/ Leach Lake Rebellion of 1898. [No. 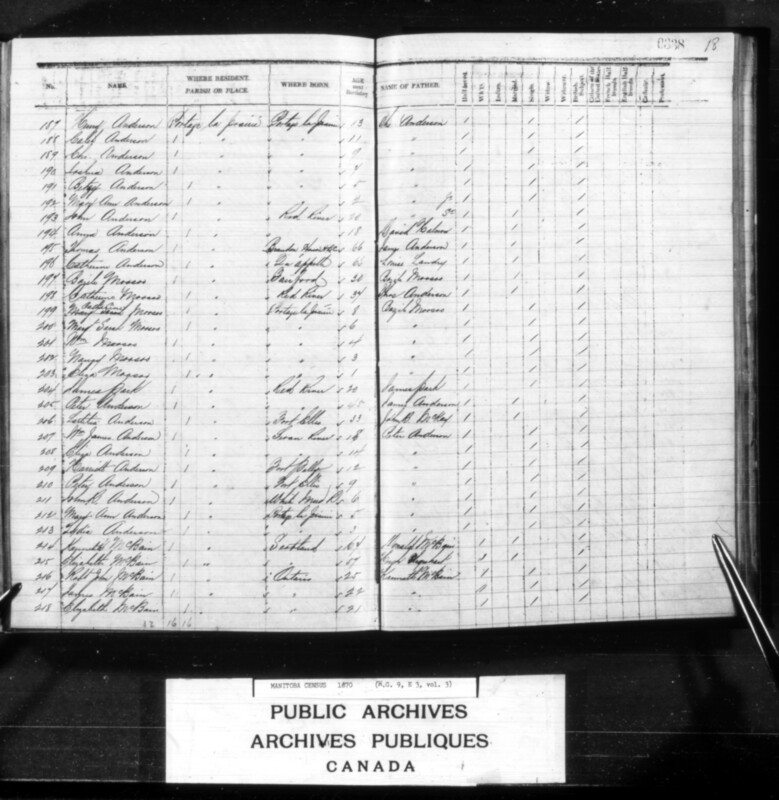 10, Treaty 1, 2nd Payment Paysheet] Anne moved to Prince Albert c. 1880; was with the Straggler Band at Carlton c. 1878-1884. She might be Annie Gaddy married to William Favel with 4 year old son William Peter Favel (see lot no. 51-58 [308-309] below). – James 9?, Joseph [?]. Banaap, married to an unidentified woman. – 5 sons, 2 daughters. Marie and Jean Baptiste Belhumeur dit Monette had children born at Maple Creek, Wood Mountain, and Fort Ellice. Marie, like her mother, eventually became a member of the Silver Creek Band of which her brother[? ], The Gambler/ John Tanner, was Chief. There, Marie farmed with her husband and a daughter from at least 1886. By 1889, however, the department of Indian Affairs insisted her husband must be expelled from their house (obtained from her mother) and from reserve land. Francois Charles, married to an unidentified woman. 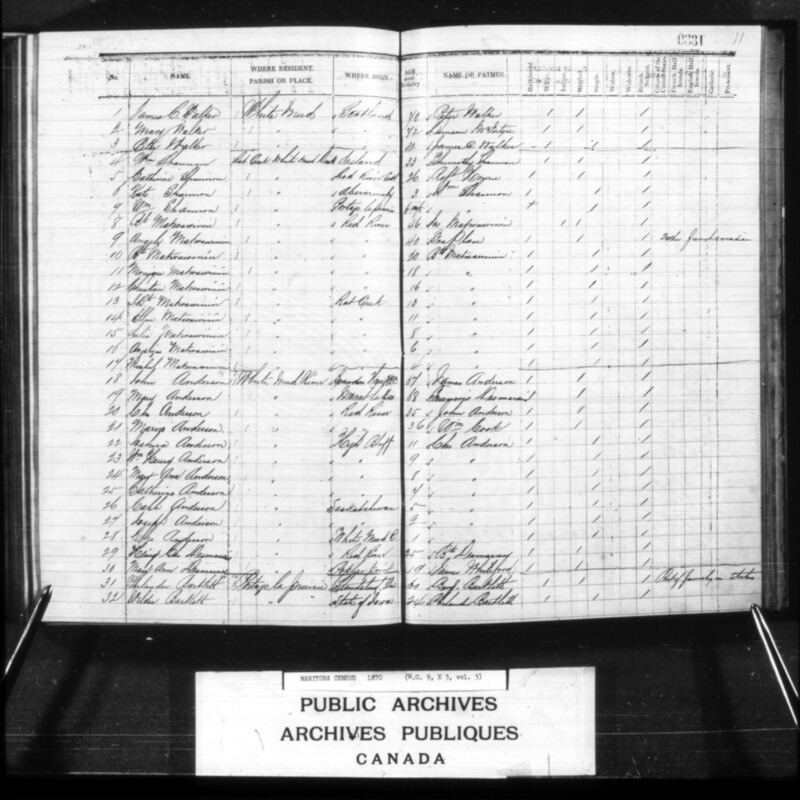 In his deposition of 1886, Joseph Deschenaux described himself as a farmer, who was residing at Edmonton on 15 July 1870. Francois Desjarlais, married to an unidentified woman. – 1 son, 2 daughters. – 1 daughter and 4 other relatives. Iendeep[? ], married to an unidentified woman. Kakanokuoh, married to an unidentified woman. – 1 son, 1 daughter, 1 other relative. Kakiwates[?] married to an unidentified woman. – 3 sons, 2 daughters. Kapetosil[?] married to an unidentified woman. Kapetwaetung, married to an unidentified woman. – 2 sons, 2 daughters. – 1 son, 1 daughter. Keechewees, married to an unidentified woman. – 3 sons, 1 daughter, 2 other relatives. Keepakesekwap, married to an unidentified woman. Kegonisausse[?] married to an unidentified woman. Kemewemiskemy, married to an unidentified woman. – 2 sons, 1 daughter. 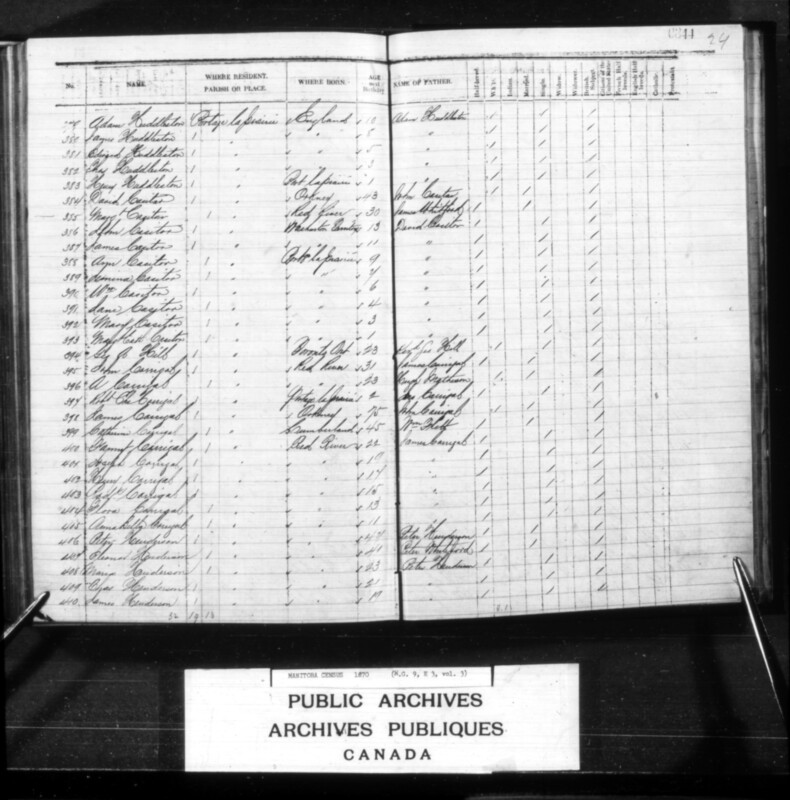 Hereditary Chief, grandson of Chief Mechkadewikonaié/ Mechudewikoraie/ Mechkaddewikonaie/ Mechkadettinnah/ Maccathy Counoye/ La Robe Noir/ ‘Black Robe,’ an initial signatory of the 1817 Selkirk Treaty (who was possibly related to Le Grande Noir at Red Lake in the U.S.). Kesepaoosa, married to an unidentified woman. Kewetimekeskenze[? ], married to an unidentified woman. Kezesewe, married to an unidentified woman. – 1 son, 4 daughters. Kissoway/ Kisoway/ Kee-she-sha-way/ Kasesaway / ‘Bright Star’/ Joseph Tanner (Métis, bom 1822? 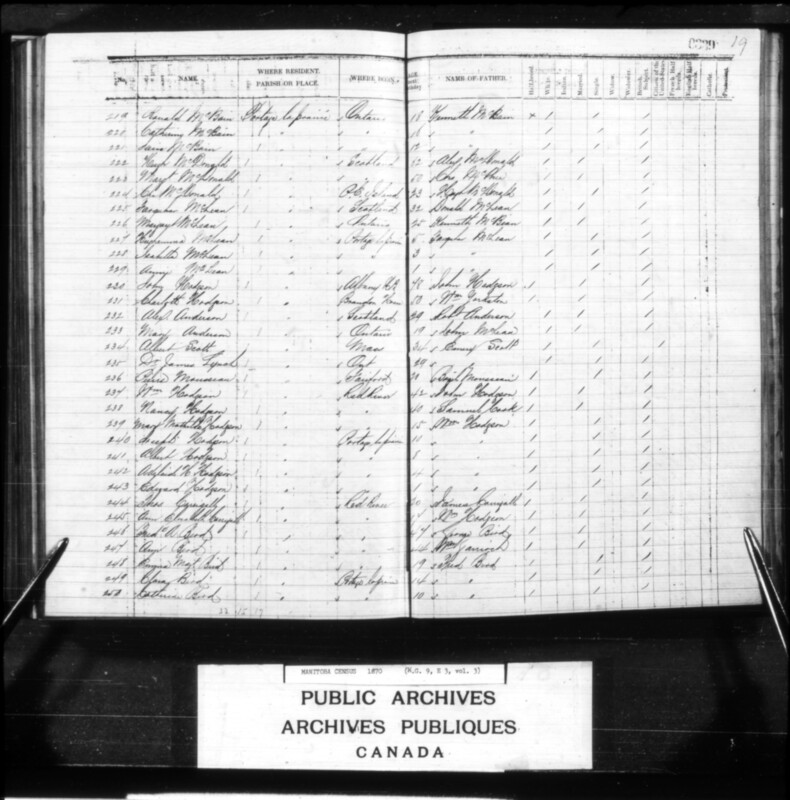 to Chief Peticho Tanner and an unidentified woman; died 1893) married an unidentified sister of Yellow Quill [Equawezanse/ Sqwasis/ ‘Little Girl’?] and/or Nesko-te-koway/ Angelique Clermont (sister of Yellow Quill? a Métis descendent of French fur trader of the surname Bouron dit Clermont). Alexander Morris described Kissoway as a trader. He ran a cart brigade with as many as 200 carts between Red River, Pembina, and St. Paul, Minnesota, with his father and on his own account. Morris described him as a member of Yellow Quill’s Band (being related to the Chief). Morris (and others) also stated that Kissoway’s father was Pechetot (although by some accounts they were bothers). Kissoway was a nephew of Rev. James Tanner of St. Ann’s/ Poplar Point who died at the Portage in December 1870. Alexander McCorrister (no wife listed). Isabella McKay, married but “Husband absent”. – 2 sons, 2 daughters, 1 other relative. Miswanyson[? ], married to and unidentified woman. 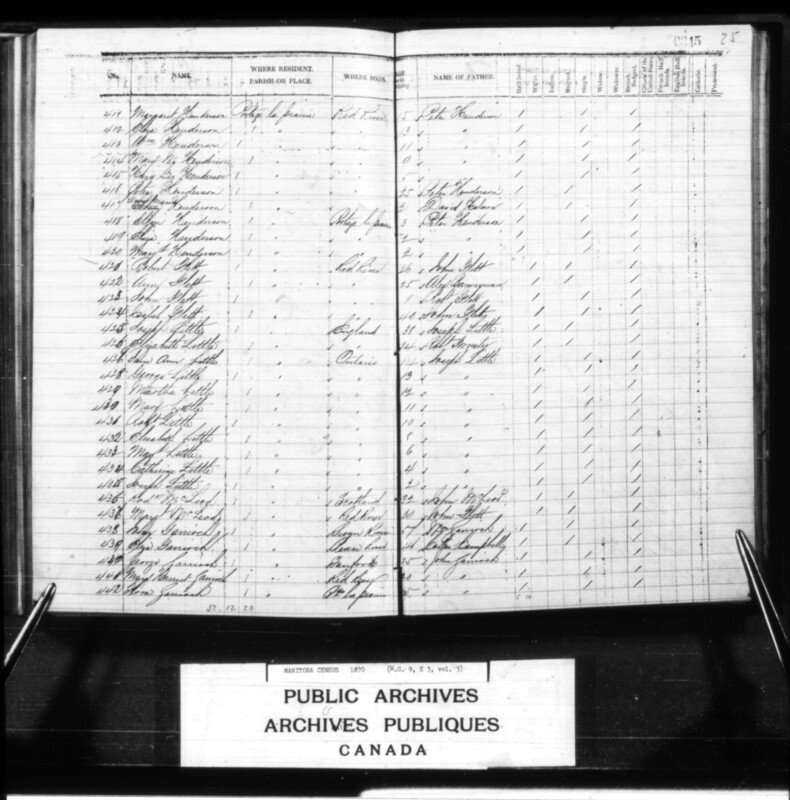 In 1870 Antoine Jr. was born at Portage la Prairie. 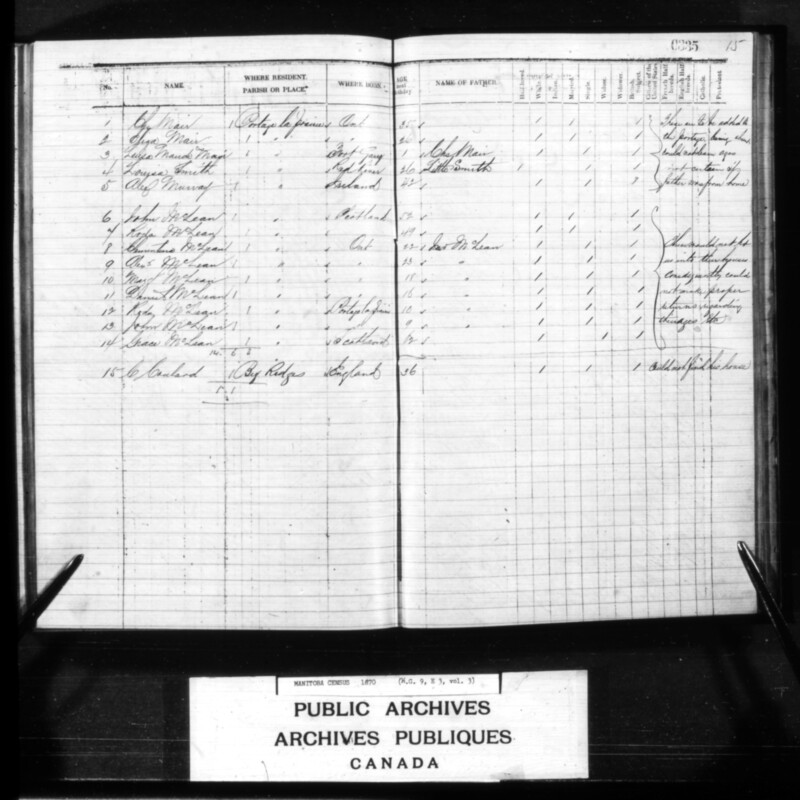 In 1876 Antoine Mousseau Sr. was listed with the Whitemud Band with his wife, 4 children, and a relative [his mother, Sawasis]. 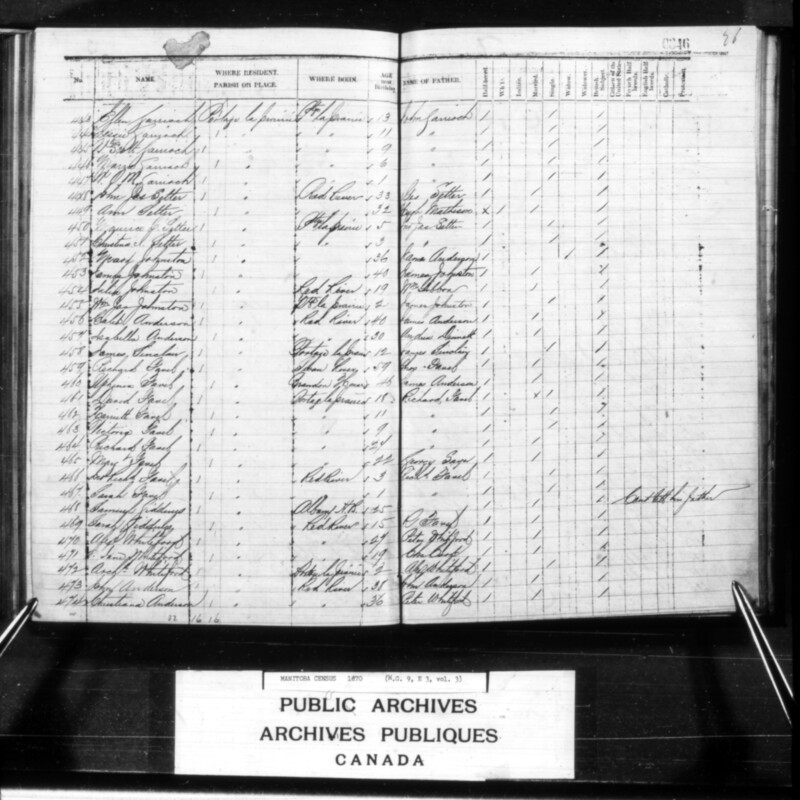 Basile Mouseau/ Mousseau/ Mouseaux/ Mosso/ Mooshew/ Mouso (Lower Canadian?, born 1778 to Jean Mousseau and Catherine Lavoie? ; deceased?) married Sawasis/ Francoise Desjarlais (born to, or sister of, Chief Peayasis/ François Desjarlais and an unidentified woman?). In 1876 Sawasis was listed with the Whitemud band. Natawinenees[?] married to an unidentified woman. Nawakamekup[? ], married to an unidentified woman. – By 1875: married (to an unidentified woman of Short Bear’s Band) with 2 children. Nezamekisik[? ], married to an unidentified woman. Ojibwoyquoy (married, but husband absent). Okeymow, married to an unidentified woman. Okegnonwackoo[? ], married to an unidentified woman. [Chief of the Portage Band] Osgamequan/ Oo-za-we-kwun/ Ooo-sa-oo-kwon/ Bozawequare/ ‘Yellow Quill’ (Saulteaux, born 1821; died 1910), married to an unidentified woman. – 3 sons, 3 daughters. A buffalo hunter, whom the HBC recognized as chief when Chief Pequakekan died in the 1860s (Kes-kee-maquah/ ‘The Short Bear’ being too young at that time). Father of Shooneyahahnuqwud/ Silver Cloud. Father of Kewesance/ Kwezanse/ Que we sans/ John Yellow Quill (born 1886). Brother-in-law to Kee-she-sha-way/ Kissoway/ Joseph Tanner. A variety of prairie grass was known as yellow grass/ yellow quill. Signed Treaty 1 and signed an adhesion to Treaty 4 — the only Chief to sign two of the numbered treaties. Ozkeenawasis[?] married to an unidentified woman. [Chief] Thomas Pachito/ Peicheto/ Peichito/ Pechito/ Petchito/ Pacheetoo/ Pecheto/ Petito/ Pettitoo/ Picheito/ ‘Image’ / ‘Little Pheasant’/ Thomas Decorby, and/or Samuel, and/or Edward, and/or Decorby Tanner (Métis, born 1800/ 1802/ 1820 to Shaw-shaw-wa-ne-ba-se/ John ‘Falcon’ Tanner and Mis-kwa-bun-a-kwa/ ‘Red Sky in the Morning’ in the U.S.; died 1872), married Apatus, and (1836?) Nejotekoe/ Nejotekwe/ Marie Jane Ledoux (born to Jean-Baptiste Ledoux and Madeleine Wehashk/ Wehnashk/ Wehwashk; later married Pehtokahan/ Francois Desmarais; afterwards married Nahweecheewaykapow). – 2 sons, and possibly daughter Anne 12. Pechito Tanner was one of the wealthier people at Portage. His large house was described as: “the best in the settlement, and was remarkable for being the first shingled house west of Winnipeg”; and as “the great pride of Picheito and the envy of the settlers.” It was built on the bank of the horseshoe slough, where his ranch was located, on the west side of the Portage Settlement, near the main road. Kissoway/ Kaseaway/ Joseph Tanner, the eldest son “the well-known trader of the north-west” reputed to run a brigade of 200 carts. Cheton/ Jean-Baptiste Tanner (born c. 1852? ; died 1937? ), married (1875) Victoire Boyer (born 1852 to Louison Boyer and Madeleine Trottier; died 1879/ 1881) and/or Mary? The name Peichito (and variations) was used for a number of generations in the family, which makes genealogical reconstruction difficult. A “letter from Edward Tanner, of Scottsville, a relative of John Tanner, the Indian captive, regarding the captive” apparently was printed in the Kentucky Gazette 4, no. 40, (Friday, 2 October 1818, Volume 31). Mention of an Ojibwe free trader identified in 1843-1844 as Potshya, a buffalo hunter and trader out of Missouri, affiliated with Peter Garrioch (who was a business partner — and relative — of James Sinclair), has been read as possibly a variation on Petchito (though it seems more likely to be a reference to Joseph Pocha). The link has been suggested because, as a free trader, Peichito is said to have run a sizable cart brigade (at one point consisting of 200 carts) between Red River, Pembina, and St. Paul, Minnestota. Peichito is possibly the Nai Pecheto a pae who signed the Fort Larmie Treaty on behalf of A’aninin/ ‘White Clay People’/ ‘White Mud’/ Gros Ventres in the U.S. in 1851. In 1854, Peicheto was identified as Edward Tanner, or Pecheto, a war chief, by his younger half-brother, Esh-ku-goe-ne-be/ Rev. James Tanner, of St. Ann’s/ Poplar Point who died at the Portage in December 1870. In 1854 as well, Pecheto “with three tents” was stationed at Ke’che’na’ah’ynang/ Big Point of Woods on the Pembina River as a guard while a mission was built, after which he went on a buffalo hunt “from June to September … all through the Assiniboine country” as far as the Missouri River. Pakoonakesick, married to an unidentified woman. Pamenswiskunzk[? ], married to two unidentified women. Pamwawakahmekummy[?] married to an unidentified woman. Paskeenzyoaskmy[? ], married to an unidentified woman. Penase, married to an unidentified woman. Popahmekaket, married to an unidentified woman. – 2 sons, 3 daughters. Poskookat, married to an unidentified woman. Potahonekesick[? ], married to an unidentified woman. – 5 sons, 2 daughters, and one other relative. Suzanne/ Josephete Tanner Pettito’s child was born at Portage and lived there to about age 6 with his mother and grandfather. By 1862, his father had left “to work for the Hudson’s Bay company.” Bishop Grandin enrolled Jean Baptiste in the ‘Indian’ school at Isle a la Crosse to 1870. He rejoined his mother Suzanne/ Josephete “and relations,” in 1871, at Fort Ellice [the Fort Ellice Band — of buffalo hunters — a.k.a. The Gambler’s Band (1881) and/or Wah-wa-shi-cabo/ Waywaysecappo’s Band (1874), along with Kisak-ka-zick, Kannskagunin, and Shapuy-witunk’s Band(s) (1873)]. Sakakoohet, married to an unidentified woman. Tatahquapun[? ], married to an unidentified woman. Topasquaas, married to an unidentified woman. Wamessequanawsoh[? ], married to an unidentified woman. Washkenick, married to an unidentified woman. – 3 sons, 4 daughters. Waskawaskokomope, married to an unidentified woman. Wawesepenais, married to an unidentified woman. – 2 sons, 4 daughters. Wayhaknaquit, married to an unidentified woman. Wesekim, married to an unidentified woman. Wesishcoop[? ], married to an unidentified woman. Winnehayo[? ], married to an unidentified woman. Woasope[? ], married to an unidentified woman. – 1 son, 3 daughters. Capt. Charles Arkoll Boulton (Canadian, born 1841). – [32-33] Wilder 24, Orange? P. 18. – [501-506] Joseph 20, Absolon 17, Mary 15, William 12, K. 9, Kavannapass 7. – [331-337] Eliza 14, David J. 11, Jane 9, Thomas 8, Bella 7, Catherine 4, Ann Harriet 2. – [342-346] Annabella 22, Mary Ann 16, Isabella 13, Henry 11, Sarah 8, [347-348] Francis 6, Archibald 3. – [351-352] Francis Alfred 7, Catherine 3. – [313-314] John Thomas 15, Matilda A. 13, [315-319] F. Edith 11, Ann Elizabeth 9, George 5, Margaret 3, William 2. – [326-328] Caroline 18, Mary 9, Eleanor 4. 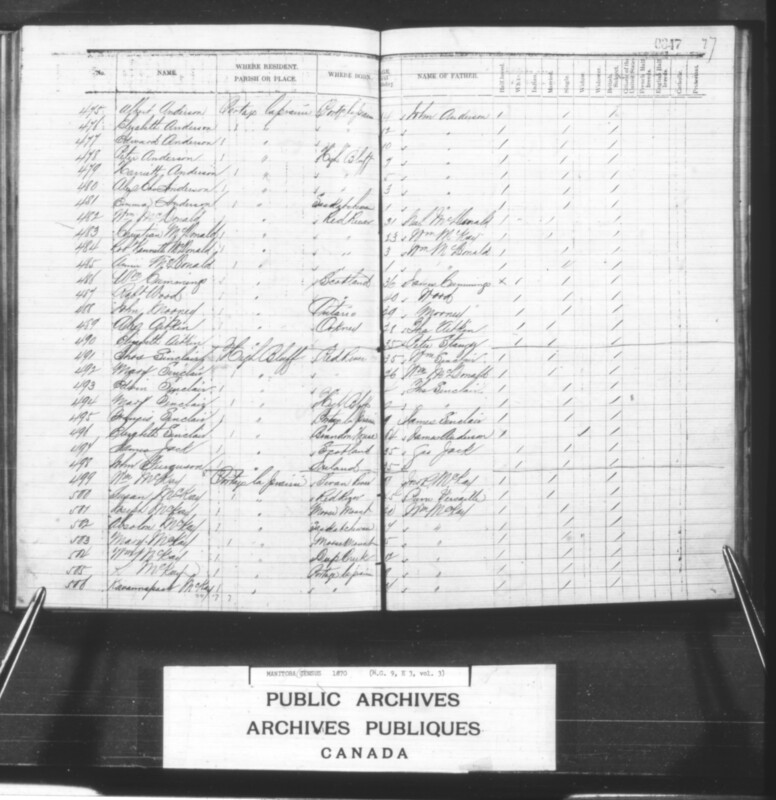 –  Catherine Desmarais 11 (Métis, daughter of Francois Desmarais). – [302-307] Joseph 14, William Charles 12, Julia 8, John James 5, Henry 3, Francois 1. – [295-299] Catherine 18, Donald 16, Elizabeth 8, John H. 6, Christie B 3. – [276-280] Mary 9, Sara Jane 7, Alice 5, Emma 3, Louisa 1. – [268-273] William H. 19, John Cepus 14, Edwin G. 15, Ann Harriet 12, Henry Small 6, Andrew James 1. –  Charles 24, [259-265] John 22, William 20, Cuthbert 18, James 16, Walter 14, Philip 12, Flora Ann 10. – [283-289] Jeremina A. 13, Gilbert H. 11, Mary M. 9, Harriet J. 7, Margaret 5, Albert C. 4, Alice E. 2. – [248-249] Emma Margaret 19, Clara 14,  Catherine 10,  Maria 8, Frederick Charles 4, Henry George 2. – [239-243] Mary Mathilda 15, Joseph 10, Albert 8, Adelaide 4, Edward 1. Possibly a brother of Hon. Alfred H. Scott, Town of Winnipeg? – [227-229] Huphenia 5, Isabella 3, Annie 1. – [216-218] Robert John 25, James 22, Elizabeth 21, [219-221] Ronald 18, Catherine 16, Iain/ Jane? 12. – [8-14] Christine 22, Alexander 23, Margaret 18, Daniel 16, Grace 12, Rhoda 10, John 9. – [207-213] William James 18, Eliza 14, Harriet 12, Peter 9, John B. 6, Mary Ann 5, Lydia 3. – [199-203] Catherine 8, Mary Sarah 6, William 4, Nancy 3, Eliza 1. – [369-374] Ann 14, William Henry 12, Edward James 10, Maria J. 7, Mary Elmira 5, C. Jane 2. –  Annie 12,  Adam 10, James 8, Edward 5, Charles 3, Henry 1. – [365-366] Abraham 19, Absalon 11. – [440-441] George 25, Mary Harriet 20,  Flora 15, [443-447] Ellen 13, Jessie 11, Walter Scott 9, Maria 6, William O.M. 1. John Garrioch reportedly took treaty with, or at the same time as the St. Peter’s Band (Treaty 1, 1871); named as No. 127 in the 1875 St. Peter’s Band Annuity Paylist, with wife. 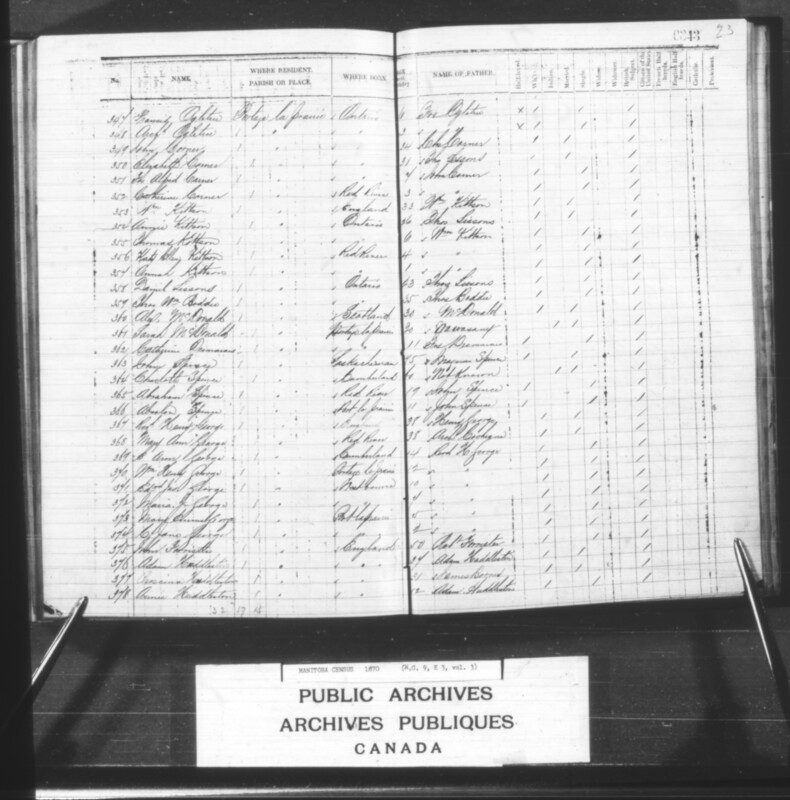 In the scip affidavit of his daughter, Flora, John is described as Métis, not First Nations. According to John’s son, Alfred Campbell Garrioch, First furrows : a history of the early settlement of the Red River country, including that of Portage la Prairie (Winnipeg: Stovel 1923) 228-229, the elder son, George Garrioch, went with the Portage Party to Kildonan Parish, witnessed the escape attempt of Norbert Parisien, but refused to shoot him. A.C. Garrioch was at St. John’s College at the time. – [427-435] Jane Ann 14, George 13, Martha 12, Mary 11, Robert 10, Elizabeth 8, Margaret 6, Catherine 4, Joseph 2. – [450-451] Maurice G. 5, Christina I. 3. –  James Sinclair 12 (Métis, son of James Sinclair). – [462-463] David 18, Harriet 11, Victoria 9. A Richard Favel reportedly took treaty at the same time as, or with the St. Peter’s Band (Treaty 1, 1871). – [466-467] George Richard 3, Sarah 1. – [386-393] John 13, James 9, Jemima 7, William 6, Jane 4, Margaret 3, Mary E. 1. – [400-405] Fanny 22, Joseph 19, Henry 17, Roderick 15, Flora 13, Anna Bella 11. – [475-481] Albert Anderson 14, Elizabeth 12, Edward 10, Peter 7, Harriet 5, Alexander 3, Emma 1. – [408-410] Maria 23, Charles 21, James 19, [411-415] Margaret 15, Eliza 13, William 11, Mary M. 9, [?] George 5. – [418-420] Ellen 3, Eliza 2, Margaret 2. – [484-485] Robert Kenneth 3, Annie 1. From 1821, ‘The Sioux’/ Dakota had made occasional visits to Upper Fort Garry, professing friendship. The U.S.- Santee Sioux wars began in 1862. On 28 December of that year “The first Sioux refugees, a group of eighty-six, appeared at Fort Garry,” fifteen of whom were from the ‘lower bands’ — Mdewakanton or Wahpekutes. They stayed only two days, concluded a treaty with the Métis, then returned to their winter camp at Devil’s Lake, U.S. In May 1863, Taoyateduta/ Little Crow returned to Fort Garry with “a party of about eighty Sioux, including a few women.” Little Crow “said that the elders of the tribe had been told during the War of 1812 that if they ever got into trouble with the Americans they should appeal to the British, and the ‘folds of the red flag in the north would wrap them round and preserve them from their enemies.” He requested sanctuary for his people in British territory, then departed. The remaining Sioux hunted buffalo alongside Métis the following spring. On their return, the number of Sioux had increased to almost 3000. They were led by Tatanka-najin/ Standing Buffalo, Waanatan [II], Wapasha [III] / Wapahasha/ Wabasha/ ‘The Leaf’/ ‘Red Leaf’/ ‘Red Flag’, and Wakinyanwaste/ Waka-nyaw-waste/ Wakingaste/ Wakinyanwaste/ Wa-kin-yan-was-te / ‘Turning Thunder’/ Andrew Good Thunder. They made their primary camps in the vicinity of Portage la Prairie, High Bluff and Poplar Point. Reportedly, the Sioux were regarded as interlopers by some Saulteaux. Allegedly, in 1864 a Sioux fishing camp on Lake Manitoba was fired upon by Saulteaux — leaving 20 people dead. Other attacks were reported sporadically. Nevertheless many of the Sioux returned to the Portage area on seasonal rounds and by 1865 there were about 680 lodges west of Upper Fort Garry. In December 1869 five hundred Sioux were said to be wintering at Portage la Prairie, including a group recently arrived from the Mouse/ Souris River, near the international boundary. More arrived in 1870. Although subsequently many moved away from the area — either back to the U.S., or to reserves — some stayed, creating Portage la Prairie Sioux Village No. 8a along the Assiniboine south of Portage. Mobile inhabitant. In 1862-1864, crossed the boundary into British territory, leading about 500 refugees. Left, then recrossed 1866. Band devastated by smallpox 1869-1870. [hereditary Chief] Matokinajin/ ‘Standing Bear’/ ‘Little Standing Buffalo’/ Louis Philippe Abelard (Santee born c. 1850 to Standing Buffalo and an unidentified woman). Mobile inhabitant. Obtained a reserve 1878 (Saskatchewan). Mobile. In 1862-1864, crossed the boundary into British territory with Little Crow and refugees; carried an alliance medal from the War of 1812, which he showed to British officials as a reminder of his nation’s relationship with the Crown. Hunted with Métis — particularly the brigade led by Jean Baptiste Wilkie, and with that of Pierre Berger and George Racette. Obtained a reserve 1879 (Saskatchewan). by A.C. Garrioch, The Correction Line (Winnipeg: Stovel, 1933), 194-195.